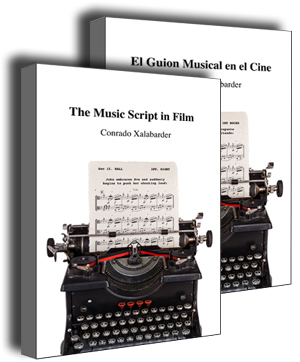 Conrado Xalabarder has released his newest book, The Music Script in Film. It deals with the use of music in films, its effects on the audience (both emotionally and rationally) and emphasizes how to write a comprehensible musical discourse in a structured and orderly manner. The Music Script in Film fills a gap not covered to date in the field of music for film, a topic of growing interest. Written to be both entertaining and educational, the book aims to interest a broad audience—not only composers and students of music but also film directors, those studying film and movie fans in general. Film music is not merely the addition of music to a film but an element that can actively contribute to a film’s dynamic, to its story line, its rhythm, something that can even add new: a good film composer is therefore not someone who writes the best music but one who is able to improve the film with the music he or she writes. Music is not simply an emotional element but rather a narrative tool that can be rationally planned. Film music has its own methodology and can arrive at more precise solutions if this methodology is understood. Anyone interested in working in the medium—either as composer or director—who does not pay attention to the uniqueness of film music, must understand that what they conceive might well be limited or, at least, affected. A good film composer must also be a good filmmaker and a filmmaker must be familiar with the resources and possibilities that music offers. This book is not about musicology, it is about cinematography. It attempts to explain the elements that make up film music so that they may be understood not only by musicians but by anyone. Everything dealt with here is taken from what great film composers have used in the course of long decades and that is still pertinent in cinema today. My intention is to put order into the chaos that composers who work in film usually face, to allow them to be able to write a coherent and effective music script that will help to resolve the challenges and difficulties each film presents and make it possible for them to do their work not simply as composers but as film scriptwriters. In addition, my aim is to help directors make decisions about music without fear or lack of confidence. This book is available from Amazon.com, Amazon UK, Amazon France.